Bone cancer. 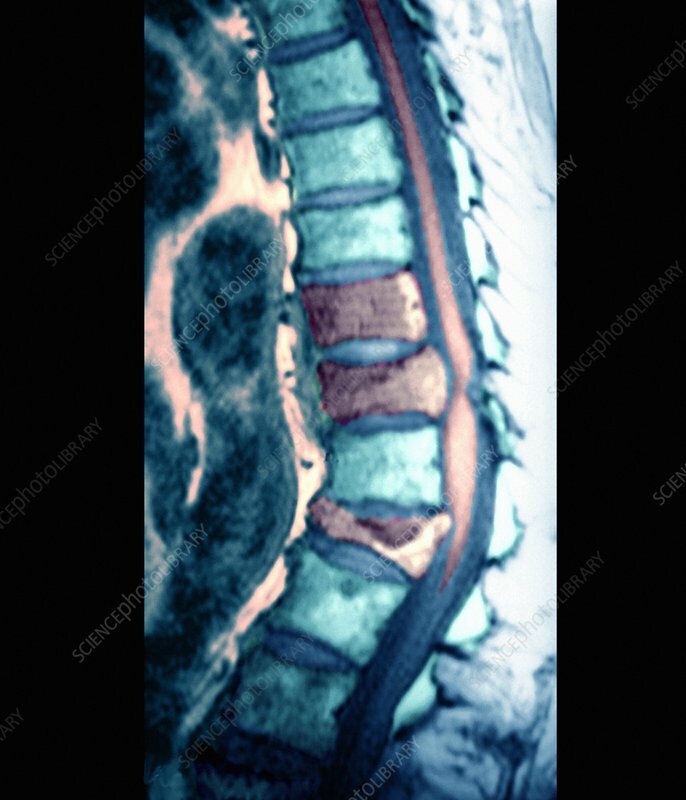 Coloured sagittal (side) magnetic resonance imaging (MRI) scan through the back of a patient with secondary bone cancer of three spinal vertebrae (grey) of the lower back. The front of the body is at left. The spinal cord (pink) runs up the space at right of the highlighted portions of the vertebrae (blue). The cancer has spread (metastasized) from a site of primary cancer in the lung. Spread of cancer to the spine is common. The prognosis is very poor. Treatments are aimed at preserving function and quality of life. Drugs (steroids) and radiotherapy are used. MRI scanning uses powerful magnetic fields and pulses of radio waves to produce slice images of the body.